When I say I’m not a huge fan of Italian food it’s not because I don’t like the cuisine per se, but more so the feeling you get after having an overly hearty pasta meal where you’d go “that’s it I’m having Chinese for the next few weeks”. Thankfully, I think I’ve found the perfect place for when I’m craving Italian without having to go through that unpleasant aftermath in my gut. Chef Pavanello takes what he does in the kitchen very seriously. Props for his constant drive to create new dishes and fine-tuning his style of cooking to suit our Asian taste-buds. When you meet someone who’s innovative and cares so much about what he prepares, you just know that what’s presented to you will taste good because at the end of the day, real dedication and passion for food is something you cannot fake. We started with the Cocoa bean crusted foie gras with port wine reduction ($28). 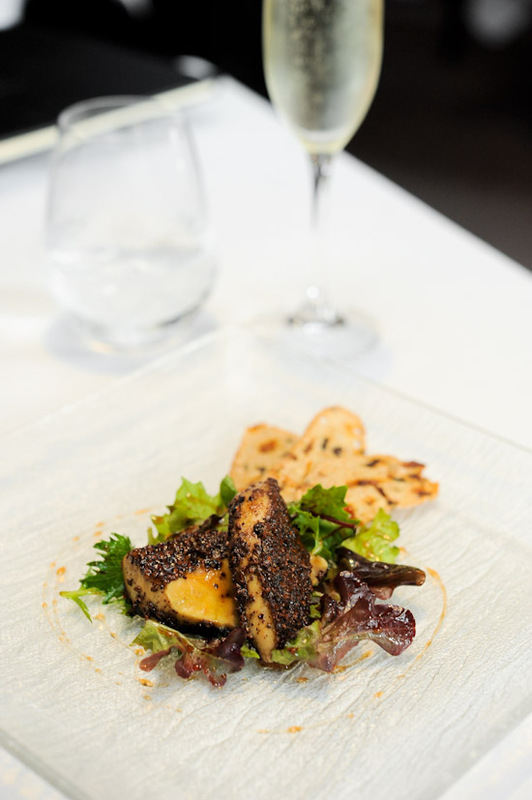 A decadent piece of foie gras coated in a crunchy cocoa bean crust on a bed of crisp salad leaves accompanied with home-made crostini. By far one of the better foie gras dishes I’ve tasted, a palate tickler starter as I would call it. I liked that it had a myriad of textures and flavours from crunchy to soft, slight bitterness (from the cocoa), to sweet and salty. Next we had the Slow cooked slipper lobster with leek veloute and morel mushroom ($28). I really enjoyed this other starter. The lobster was fresh, sweet and tasted of the sea. The leek veloute was flavourful & rich without being overly indulgent and complimented the perfectly cooked crustacean. The Homemade squid ink tagliolini with lemon and chilli marinated prawn ($28) was pretty interesting for me because it’s the first time I’ve had squid ink pasta without a cream/squid ink based sauce. I was pleasantly surprised that I actually prefer this to the former two alternatives. Homemade noodles (cooked al dente, no less) tossed very generously with prawns. I loved how the lemon zest and the chilli gave the dish some lightness and heat without over-powering the sweetness of the prawns. This one of those pastas where you’d finish, not get sick of and want more. Homemade potato agnolotti with chicken jus and crispy bacon ($28). From plain sight this dish doesn’t look like much but it’s a whole different story when it enters your mouth. Although there’s no physical trace of chicken in the agnolotti, the flavour that bursts through was akin to a hearty roasted chicken meal complete with mash, peas and the works. The crispy bacon added a nice contrast of texture and a kick of saltiness. The European seabass fillet with sauteed mushrooms and potato ($42) followed after. Wasn’t exactly a big fan of this main but the fish was well executed and I liked that the sauteed mushrooms and potato had strong hints of basil. Lastly, the Pièce de résistance; Crispy “suckling pig” lacquered with acacia honey & balsamic vinegar ($48) that was accompanied with braised endives. I’m usually not a pork person but wow, this bought me over. Think sinking your teeth through perfectly crisped skin and into the juiciest, most succuluent piece of meat. All I can say is yes, yes & yes. A must-have! Our meal at Otto Restaurant ended with Creme Brulee ($14). One thing I particularly love about this dessert (besides eating it) is the part where I get to use a spoon to tap on that thin glass of torched sugar and hear the sound of it crackle. So I did, revealing a silky, smooth vanilla cream infused with kaffir lime leaves and citrus notes, paired nicely with marinated strawberries. If you’re looking to try an Italian restaurant that’s authentic and classic with a modern twist, Otto Ristorante is a great place to head to (if you haven’t already). I assure you it most likely won’t be your only visit. Jolene Koh is the owner of Cupcake Weekend, which provides artisan cupcakes for every occasion. From media events, product launches, birthday parties, to weddings, baby showers, as personalized favours or just because you feel like having a cupcake. Great review ! Actually I used to work here, and trust me it changed the way how I eat should eat my pasta. It’s a pity you didn’t try their uni pasta though, its one of the best sellers !